What is an Epl ? 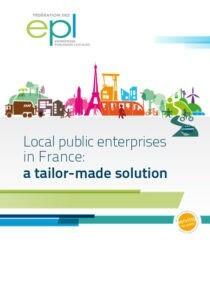 Local public enterprises (LPEs) serve local authorities, companies and citizens. They stand at the crossroads of private and public sectors, as they are real flexible and responsive businesses, while following general interest and community values. LPEs are organized under private law and deliver services of general interest. Public authorities hold at least 34% of the capital shares of these limited companies (Sociétés anonymes). LPEs in France cover 40 areas such as urban planning, housing, tourism, transports, energy, waste management and water, have near 74,000 employees and generate a turnover of more than € 12 billion. LPEs form a network of more than 25,000 enterprises in Europe. LPEs take regularly part to European projects, mainly through structural funds. Local public entreprises gather three different legal status : Sociétés d’économie mixte (Sem), Sociétés publiques locales (Spl) and Sociétés d’économie mixte à opération unique (SemOp). The Sem are traditionally the most significant type of LPE in France, but have to comply with competition rules. A Sem requires at least two shareholders, both public and private (banks, companies, or chamber of commerce and industry). Between 50 and 85% of its capital is held by public authorities. Its activities are not limited to the territory of its respective local authority: a Sem can operate in all areas and for all stakeholders. The Spl, which are tools for cooperation among public partners, can be created by local authorities since 2010. They require a minimum of two local authorities and cannot include private shareholders. As they are considered as in-house tools, The Spl are exempted from competition rules, but are therefore not able to operate outside the local authorities’ territory. The SemOp are Institutionalized public-private partnerships, which have been introduced into national legislation in 2014. They give the local authority the opportunity to choose at least one private partner, which can hold between 15 and 66% of its capital. They are created for one single mission and are therefore time-limited. The Federation of Local public enterprises was established in 1956 in order to represent the interests of all types of local public enterprises. The general assembly is composed of local elected representatives of the involved local authorities and representatives of the private shareholders, from all shades of political opinion. Promoting local public enterprises to local authorities. The French LPEs are part of a European movement which is more than 25,000 enterprises strong. Since 1998, the FedEpl has been actively participating in leading the European movement for LPEs within the «CEEP» – the European Centre of Employers and Enterprises providing Public services and services of general interest. CEEP represents the interests of European LPEs to the European institutions. CEEP organizes every two years the CEEP-CSR label ceremony, which is the occasion to award enterprises for their groundbreaking CSR commitments and practices.